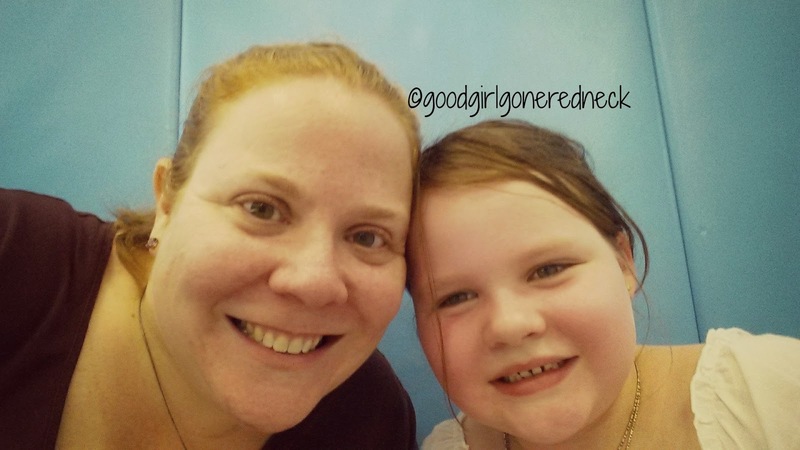 Good Girl Gone Redneck: Dance with me! Yesterday my daughter had her first school dance. Not the kind of will you dance with me kind of dance we all remember loathing so much. But the kind where parents attended and it was actually okay that they danced. I might have to admit that I danced more than my daughter did. My seven-year-old daughter. Have I mentioned yet that she's seven now? Probably not. I hold off on that sort of stuff these days. Sometimes I look at her and see that face that's still the baby I held in my arms. And then she puts scarves on us both and asks for her fancy shoes (with a request for high heels, but we're not there yet) and is ready to go to the "ball" at her school. But then we get there and she's running around and sliding across the floor and laughing and crying over a ridiculous little plastic ball-pit type of ball. It's amazing how she changes in the blink of an eye. Literally. I know - that word - using that word - she's not really CHANGING as I blink my eyes. But at the dance? One blink meant she went from dancing next to me, all fancy-ish to running around like a little girl playing. It was as close to literal as possible, so I'm going with it. Anyway, it was so much fun. I lost track of what I was saying because I am sitting here listening to Pitbull and dancing in my chair. Honest. Dancing. In. My. Chair. And this morning my daughter was singing about "$20 in my pocket ..." so it's all good. Because sometimes you just have to put the rest of your life on hold and DANCE. Enjoy it. Feel it. Listen to the music. Sing along. Whatever it takes. Even if you're sitting in your chair. It's all good. *It's a video with the lyrics and no half-naked Ke$ha, promise. I needed it to be safe for my kiddo to watch with me when I show it to her later! p.s. I'm linking up today with Tanya for her Small Victories Sunday link-up! Come on over and join me there. How sweet and so special. They do grow up so fast. I posted a saying to Instagram that said "They will be grown before you know it. Record it!" Dance like no one is watching--just dance! We were at a wedding last weekend, and the absolute best part was watching my son (he's 21) dance. I never knew what a good dancer he is! It was thrilling. And yes, it DOES go that fast! I love the picture of you and your daughter she is precious!! They do grow up so fast, and it really does feel as if I blink and another year has gone. My baby turns 9 in April and I still don't know how that happened?!!! Thank you for sharing a sweet memory with us! Oh yes, I LOVE dancing even though I have 2 left feet. And one is never to old, I just started to learn bachata from one of my students. Yes, always save time for dancing! So sweet that your daughter is at that stage between little girl and teen. Treasure these years -- they go so fast -- as you well know! I believe in the power of dancing. Even though I'm not great at it, I still do it almost every day. It makes me FEEL great. That whole changing thing? I totally get it. My ten year old is the same way. All grown up and still a little girl in the blink of an eye. It is a wild ride. Hi Andrea! I'm Heather and I have a question about your blog! If you could email me at Lifesabanquet1(at)gmail(dot)com that would be great! Grab those moments and savour them; one day you'll blink and she'll be all grown up. So very sweet, I love the picture of you and her. How fun that parents were invited. Our sons' elementary school didn't do that. They have a mother-son sports event and a dad-daughter dance both of which exclude me and my son. We would totally dance! We love to dance. at home. in the store. in a chair. in the car. Hope you come back and link up more next week and found some awesome blogs in the linkup! Pinning to my Small Victories Sunday Awesomeness Board and sharing on Twitter! Ahhhhhhhh so sweet:) My 3 year old is always asking us to dance with her.. They grow up too fast! Very sweet! Our whole family was SUPER crabby last night so we put on a song and just danced around. It's something we rarely do, but I think I would try it again. It really worked to break the funk.